You find that guy really everywhere. You have a nice view! Buddha always looks happy and maybe even happier in Ireland. He seems to enjoy himself there. These make for a happy smile! I have two here in the house. Love that guy! I've wanted one of these for a long time but haven't be able to find just the right one. This would work. Can I send you my address? :) Cute. 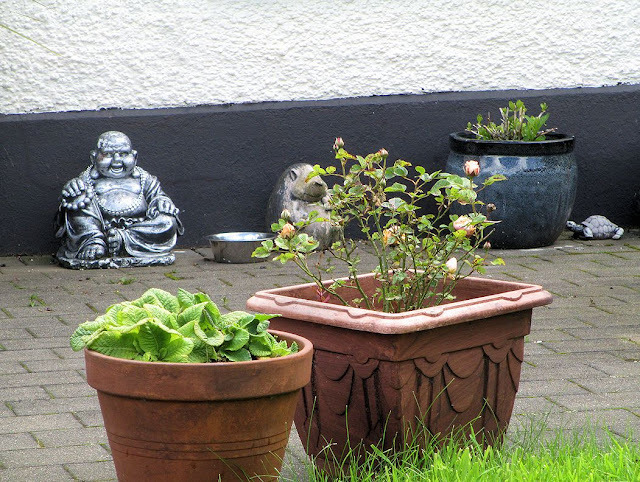 I like happy Buddhas, and happy people! A good addition to a garden area! This made me smile, Bill! How nice! I love Zen music, I find it quite soothing. Thank you so much for sharing. I think I need one of those! I love that Buddha! Last night I met with my art club for our June art challenge and the subject was "Buddha". We saw lots of ways to artistically represent Buddha. A zen moment captured! Lovely! It looks as if he has some buddies around, too. It's very nice; hard not to smile at his smile.